Stay posted for next dates!! Specially designed to celebrate the colourful and mystical spirit of India, our bouquet of rooms speak to your senses, lets you soak in the relaxed vibes of our property and resonate with your inner balance. Our in-house restaurants dish out tasty & healthy organic fare complete with superfoods to help you detox your system. From enjoying our natural salt water swimming pool, sunbathing on the sandy Morjim beach or watching the sun set into the Arabian sea, you can experience it all at Devarya Wellness - the serene environment to stimulate your mind, energise your body and speak to your soul. A space to just be. 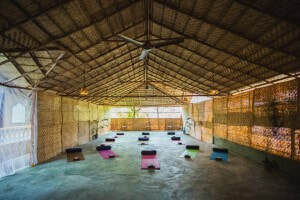 Devarya Wellness space, offers an escape from the mundane. 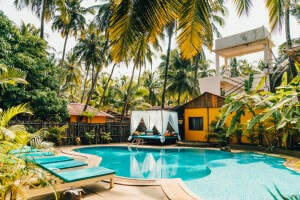 The luxurious accommodation set in a lush garden is located just a minute walk from the Morjim beach stretch and is specially designed to give you a tropical holiday that you deserve. The rooms across the property which spans 7000 sq metres, seamlessly blends the elements of a Goan Portuguese heritage with the aesthetics of Rajasthani royalty. Each room is vibrant, airy and filled with natural light and good energy. Tastefully furnished with earthy decor that has been handpicked to reflect the elements of nature. This accommodation offers you the beauty of traditional design combined with all the contemporary comforts of a luxury property. 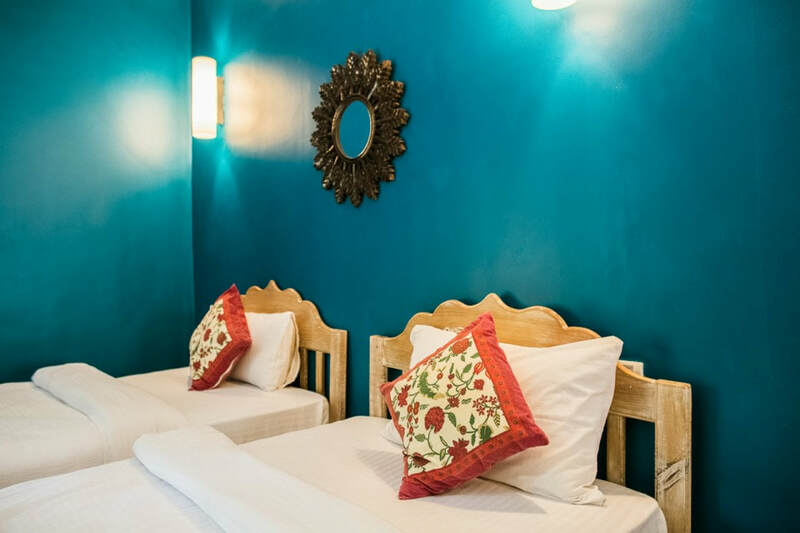 All rooms come equipped with a private bathroom, most with a private balcony, comfortable beds, spacious cupboards, fresh linen, a ceiling fan, an air conditioner and a mosquito net on request. 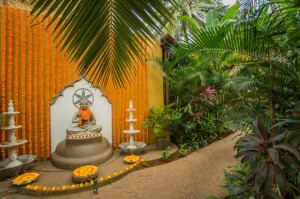 The Chakra Standard rooms are situated at the centre of the resort, in a building opposite our leisure pool with views of the beautiful tropical gardens. 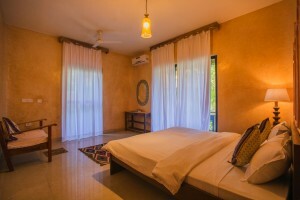 Our Chakra Standards all come with a comfortable bed, private bathroom, storage cupboard, fan and air conditioning. Some of our Chakra Standards also have a private balcony. All of our Chakra Standards have twin beds that can be combined together to accommodate a comfortable, double sleeping arrangement. Each of the cottages are surrounded by palm trees and the luscious tropical greenery that Devarya Wellness prides itself on. 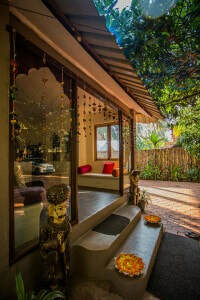 Each Chakra Cottage has a glass front offering you a light and airy space for your yoga holiday. Our cottages’ all come with a comfortable bed, private bathroom, storage cupboard, air conditioning, fan and a private balcony. 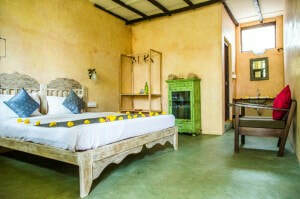 Our Chakra Cottages have twin or king size beds that can accommodate a comfortable, double or twin sleeping arrangement. 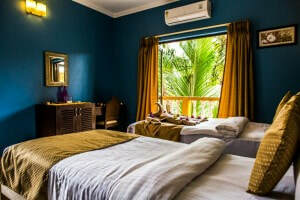 The Chakra Juniore Cottages are smaller and offer a more budget friendly option. At Devarya Wellness, we have carefully designed Chakra rooms to compliment to various chakras. All chakra rooms have a private bathroom, private balcony, a fan, air conditioner, built-in wardrobe and a four post king size bed. All of our rooms are fully furnished with Rajasthani beautiful furniture and modern amenities. Chakra is a Sanskrit word and translates into “spinning wheel”. Ancient yogic wisdom tells us there are seven main energy centers in our body. Each of our chakras flows with a color-coded vibration frequency in the universe which can influence our physical, emotional and spiritual well-being. When our chakras are perfectly aligned with the universal flow of energy, every aspect of our life becomes harmonious and we are able to connect to our bliss. 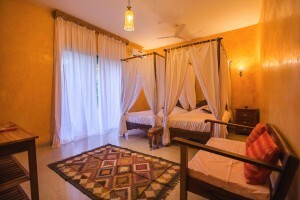 At Devarya, each room is carefully designed to complement each chakra and therefore called "chakra rooms". It is with great pleasure that I again invite you to join me and my dear Rasa Yoga sister Claire Saunders for an experience that you'll never forget. We met during our 300 hour advanced teacher training with Sianna Sherman in Berlin 2015 and teaching together comes very naturally and easeful for both of us. Claire has a light heart and we instantly had many great laughs (and cries as tends to happen when we work deep!). I'm very much looking forward to this amazing co-operation. Claire been teaching yoga since 2005, is certified at Yoga Alliance’s RYT®500 level, and YACEP®, a Rasa Yoga teacher, and a qualified Anusara Inspired teacher. Claire also runs specialist trainings for qualified yoga teachers. Claire’s highest vision in teaching yoga is to connect with each student at her or his own level, to allow them to connect more deeply with themselves and thereby with the world at large. She loves to tell stories from the mythological traditions which add a richness to practice. Read more about Claire here and check her website out. 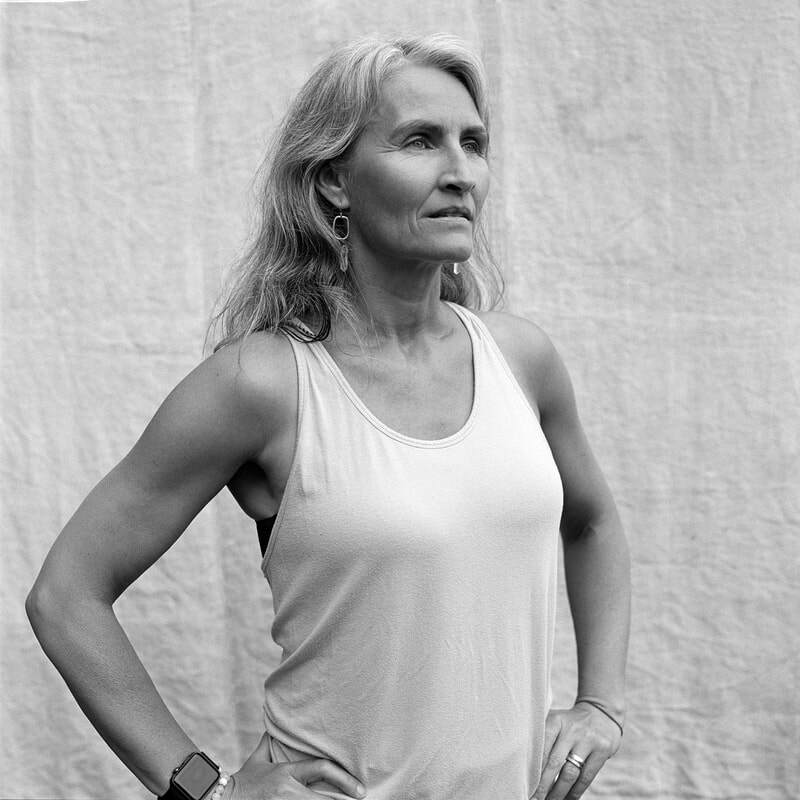 Hrönn is Anusara Inspired™ and Rasa Yoga teacher, certified with Yoga Alliance as E-RYT® 500 and YACEP® (Yoga Alliance Continuing Education Provider). She's been teaching since 2011 and in that time she's taught more the 6000 hours. Practicing yoga with Hrönn is intense, lots of fun and insightful as she always works with themes in her teaching. 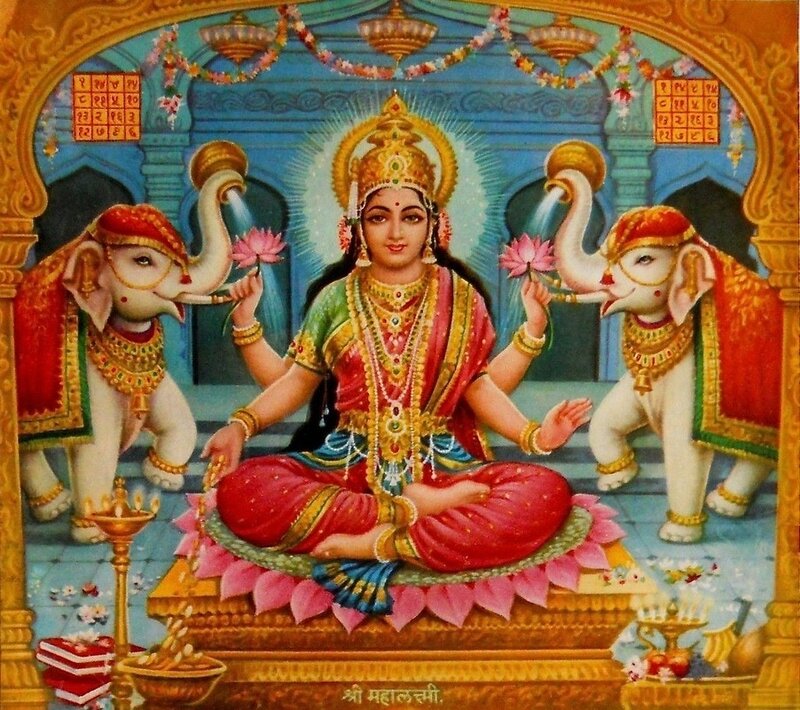 These themes are living stories from her own life, nuggets from Tantrik philosophy or other wisdom texts that invite you to go deep into your practice and cultivate qualities of the Heart that support your connection to Self and your growth as a human being. Hrönn’s teaching is easy to follow, challenging and motivational at the same time. Read more about Hrönn here. Arrival is on Sunday and dinner is at 8pm. Each day, there will be a morning yoga practice, followed by Breakfast Brunch. There will be time to enjoy the beach, the pool, or other activities bookable at Devarya, followed by an afternoon yoga practice with more of a slow flow and restorative feel. There will be a rest day, probably Wednesday, to give an opportunity for rest or a trip. The morning sessions will be fiery, dynamic and flowing practice that aim to build courage and strength in order to empower you. The afternoon practices will be more soma/nectar and vary between gentle and restorative work, focusing on being present with what is, release and letting go. Full schedule will be sent to participants 1 months prior to the retreat. On arrival day, Sunday, there will be a traditional fire ceremony (Agni Puja) and a short practice. On departure day, Sunday, there will be no practice to ensure a smooth relaxing departure. ​Hrönn and Claire are dedicated to teaching all levels of yoga students, so this is a great opportunity to grow in yoga, whether you are a beginner or an experienced student. Morjim is around 50 kms from the Goa International Airport in Dabolim, from where you can take a taxi or we can pre-book a taxi transfer for you. The nearest railway station is the Pernem Station, which is less than 20 kms away. There are frequent buses from the capital city of Panaji and the city of Mapusa to Morjim. 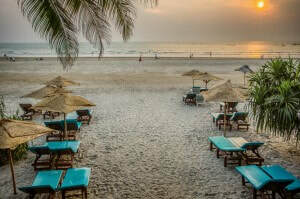 There are lots of regular and charter flights to Goa – you can search for these online. Visas are required for all foreign nationals visiting India – check www.indianvisaonline.gov.in for current requirements and fees. 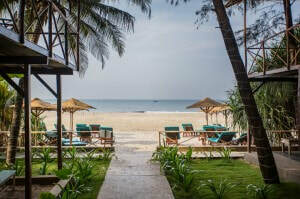 Make sure you take out comprehensive travel insurance as soon as you book your retreat. Bring mosquito repellent, sun protection (and a hat), beach towel, a torch and bite relief cream. There are mats available but you are free to bring your own. Single rooms are limited and price is on application. Not included: Flight tickets, transport from and to Morjim, medical and travel insurance. Excursions and activities booked at the resort. Payment by invoice also available - please send an email to us and we'll send it right back. For residents of DK - it's also possible to pay via MobilePay to 96095 and write "your e-mail & Goa" in the message OR by invoice.